I can’t help but feel a small tinge of guilt playing and enjoying a game about Jack the Ripper. If you haven’t guessed the game, I’m talking about Letters From Whitechapel. 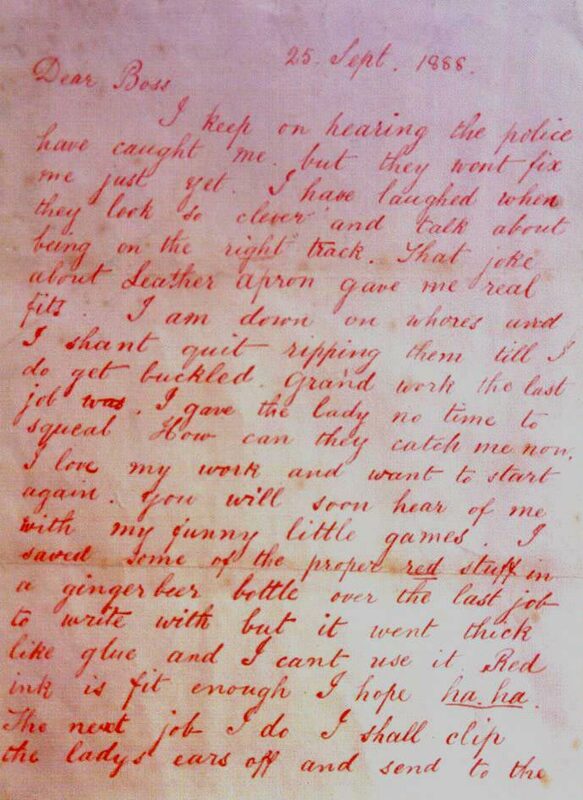 In Letters, one person plays the part of Jack the Ripper, committing murders and attempting to return to his hideout before the other players (the investigators) arrest him. For those of you who only have a vague understanding of Jack of the Ripper, his reign of terror began in the Whitechapel district of London in 1888, and the name “Jack” came from a letter written to the press, presumably by the serial killer himself. His method was gruesome and distinct, surgically removing internal organs in at least three instances and slitting throats. His murder victims were women. There were a whole slough of murders — eleven to be precise — that occurred between October 1888 and February of 1891. Only five of these murders are considered to be the “canonical five,” that is the five victims most likely to be linked to Jack, though there is some debate that Jack changed his methods in order to throw investigators off the trail. Scholarly debate (and not-so-scholarly debate) still rages over the truth of it all. 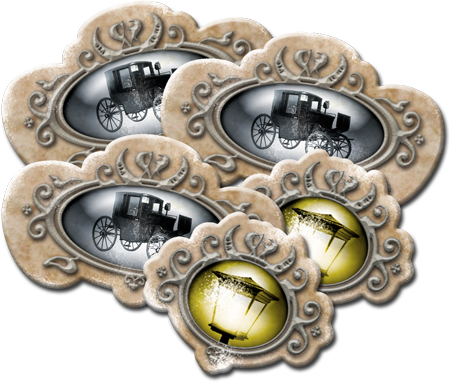 Letters from Whitechapel, uses these five murders as the theme and structure of the game. Jack spends his time deciding when to strike and how to get home. The longer he contemplates the target of his next victim, the more time he has to get back to his hideout. You see, each round (or murder) begins with the board filled with potential murder victims and investigators. In order to introduce an element of uncertainty in the game, Jack doesn’t initially know the precise locations of the investigators, that is until he strikes! Similarly the investigators begin each round not knowing where the potential victims are, but by the time a murder actually occurs, all is known, except where Jack is headed. The board is reminiscent of other games in the cat-and-mouse genre of board games. 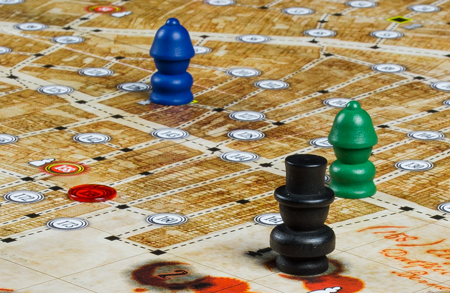 If you’ve ever seen or played Fury of Dracula or Scotland Yard, the board is designed similarly, this time with an expansive web of locations inside London’s Whitechapel District. As Jack commits his murders and tries to reach his pre-selected hideout in a set number of moves, the investigators try to find his trail. In order for Jack to win the game, he needs to commit five murders (two of them on a single night) and return to his hideout, evading arrest. In any event, Jack doesn’t always move one space at a time. Each round he has an allotment of carriage and alley moves to aid him in his escape. These special moves diminish as the game goes on, and can make getting home after the final murder a bit trickier. Carriages allow Jack to make a double move, and alleys allow Jack to cut across small or expansive blocks that would otherwise be considered illegal moves. 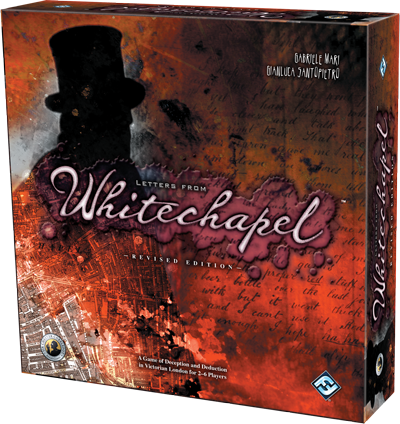 As the investigators plumb the dark alleys of Whitechapel, each has the option to search for clues (that is any spaces where Jack has moved on or through) in all the surrounding areas of an investigator’s current location, or an investigator may declare an arrest in one adjacent location for the win. As the investigators uncover these clues (if they’re lucky) red, transparent discs are placed on the board, illuminating a trail, sometimes distinct, sometimes not as clear as the investigators would like. Assuming Jack returns to his hideout, the red discs are removed before the start of the next round, and the investigators begin to draw conclusions (often conflicting) on where this monster lives, this fellow gamer — formerly your friend — smiling nefariously at your from across the table. This game of cat and mouse plays out. The tension is palpable. The theme aptly dark. The players scheming and counter-scheming. The components top notch. And if Jack is arrested or runs out of moves — in other words, the investigators are able to set a successful dragnet — he loses. 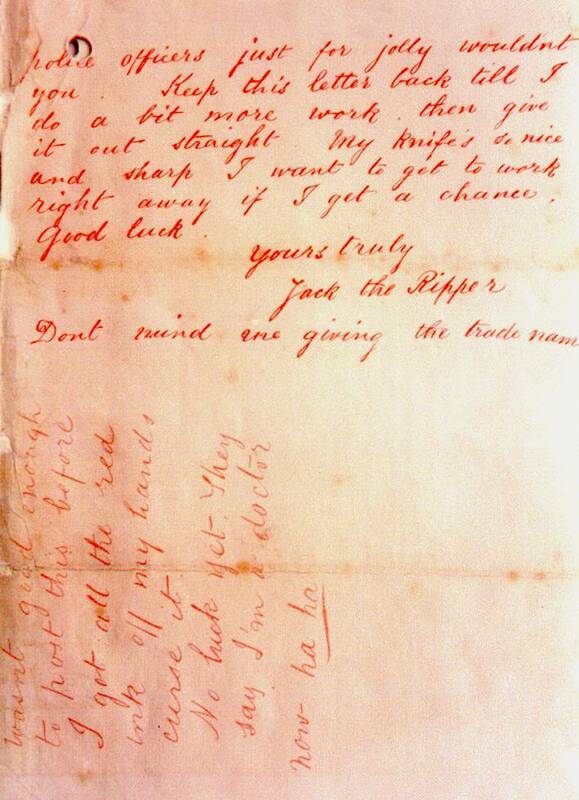 The “Dear Boss” letter was a message allegedly written by the notorious Victorian serial killer known as Jack the Ripper.